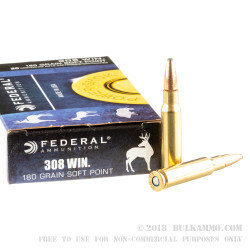 Federal’s Power Shok .308 Winchester ammunition line is a heavy hitter in the cartridge world. Power Shok rounds are designed specifically for the end user to be reasonably priced, accurate, reliable, and to provide the hunter with consistent results in the field. The 308 Winchester cartridge first hit the market in 1952 and was introduced by, yep, you guessed it, Winchester. Today, .308 has one of the largest variety of bullet types, configurations, and grain weights available. The 308 is traditionally used in a hunting role with deer and other larger North American game as its major focus. The Federal Power Shok 308 is topped with a 180 grain, copper jacketed, lead core, soft point, bullet with a cannelure ring that helps secure it into the case when the crimping is applied to the case mouth at the factory. 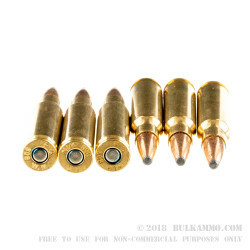 These bullets are factory loaded into a brand new, reloadable, highly polished, thick walled, heavy duty, Non-corrosive Boxer Primed, brass case. They have a muzzle velocity of 2570-feet per second and a heavy hitting 2640-foot pounds of muzzle energy that helps ensure lethality out in the field, while on the hunt. 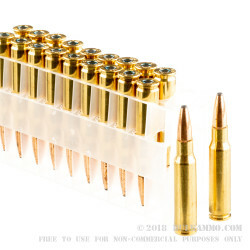 These rounds come packed up in boxes of 20 rounds, with that classic blue Federal Ammunition Power Shok box that is so widely known and easily recognizable. Get yourself a couple boxes today so you're ready to hunt, ready to head off to the target range, or ready to enter that long-range rifle match you've been wanting to compete in. Q: Does this product come in 168gr and do you stock it? 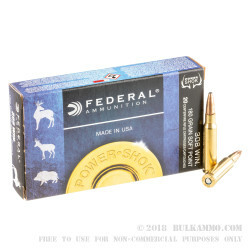 A: Federal .308 Power-Shok ammo is only available in 150gr and 180gr projectile weights. However, Federal Gold Match ammo is available with a 168gr BTHP bullet. A: As a general rule, that is true. However, FMJ can be effectively used for hunting (where allowed by state/local law) if you are careful about shot placement, and there's no law that says you can't shoot soft point ammo at paper for target practice.